Hashtags are now ubiquitous in our online social communities. Because of their ability to aggregate related content, hashtags are a reliable way for users to find information on social platforms that is relevant to their interests. Incorporate hashtags across your media and your platforms. 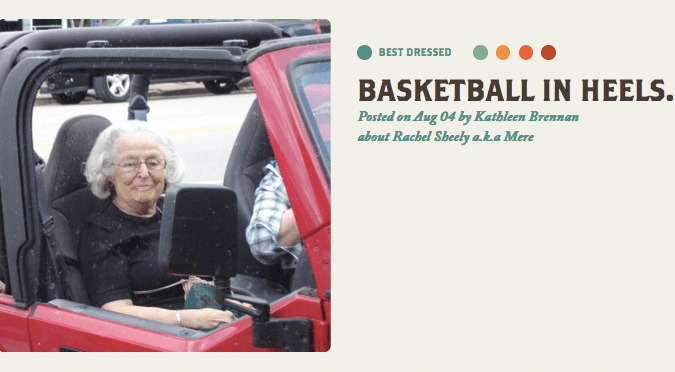 Include RSS feeds on story pages. Promote easy sharing of your hashtag across multiple platforms. A hashtag is a way of categorizing a social media post. Within individual social sites, hashtags aggregate posts by multiple users into a collection of related social content. The hashtag becomes a searchable link, taking you to the collection of posts across the site using that specific hashtag. Hashtags are predominantly used on Twitter and Instagram, but can also been seen on Facebook and other social sites. Because hashtags allow users to browse posts beyond their own group of friends or followers, they have been extremely useful as marketing tools. Both nonprofits and corporations have jumped on the hashtag bandwagon as part of their advocacy, fundraising and sales efforts. Hashtags not only connect an organization to today’s social sharing culture, they also allow users to act as an extension of the organization’s marketing team. Many nonprofit organizations have created hashtags to promote their digital storytelling campaigns and causes. 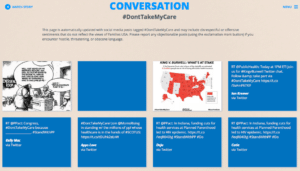 FamiliesUSA is one such organization, establishing the hashtag #mycoveragestory alongside stories of citizens who benefited from the Affordable Care Act, and then implementing a new hashtag, #donttakemycare, with another set of stories. Social sharing is heavily promoted with each video, and when a user clicks a share button beside any story in either of these collections, a hashtag is automatically added to their message. The aim of such campaigns is that the hashtag may gain traction and start an online conversation around a nonprofit’s issue of concern. The Throwback Summer campaign employed hashtags in a slightly different way. They asked stakeholders to share their own grandparent stories with an already-in-use hashtag, #GrandparentsDay, which had the effect of raising the profile of their organization in a conversation that was already happening on the web. Because of its simplicity and integration into most digital platforms, the hashtag is a promising way for nonprofits to promote their content and increase engagement with the issues that matter to them. It is likely no surprise that for-profit corporations have capitalized on the hashtag’s capabilities to promote their products, services, and cause-related endeavors. Under Armour, for example, launched the I WILL What I Want campaign last year to promote its line of women’s athletic gear. This cross-platform campaign featured the stories of female athletes overcoming rejection and adversity to achieve their goals. The hashtag caught on across Twitter, Instagram, and Facebook as users showcased how they applied the phrase to their own lives. The campaign was the company’s most successful since their founding. In another example, a popular video blogger helped Nike launch its #MakeItCount campaign in 2012 as he documented his travels around the world. Upon releasing the video, the Make It Count hashtag spread through social media as users shared their own #MakeItCount moments. While many nonprofits may not have the resources to deploy campaigns on this large of a scale, they can still look to corporations for inspiration. 1. Incorporate hashtags across your media and your platforms. Always Corporation’s #LikeAGirl campaign perfected this strategy. The hashtag truly is central to the campaign: It’s featured across their website via text and images, in their YouTube videos, and on their Facebook, Twitter, and Instagram. Their videos, in particular, call upon the viewer to share how they are unstoppable, with the hashtag incorporated directly into the graphic elements of the videos. Today, the #LikeAGirl campaign sees a consistently high level of engagement across social media. Nonprofits can mirror this strategy by incorporating their hashtags into their digital stories and across their platforms. 2. Include RSS feeds on story pages. A great way to get users to promote your hashtag is by including them in the conversation. An easy way to do this is to include an RSS feed on the page with your organization’s stories that shows user-generated responses using your hashtag. Or you could follow FamiliesUSA’s example and dedicate an entire page to an automatically updated feed of Tweets using your hashtag. 3. Promote easy sharing of your hashtag across multiple platforms. Social media sites extend your stories’ reach to new audiences. An easy way to promote sharing across multiple social sites is to automatically generate sharing messages with your hashtag when clicked by the user, as FamiliesUSA did with their #mycoverage and #donttakemycare campaigns. #BuiltByImmigrants and DaDaab Stories also employ this tactic in order to raise awareness about individuals stories related to their cause. This simple tactic saves the user from having to manually enter your hashtag into their social content. 4. Choose the right hashtag. Nonprofits must find hashtags that connect to their mission or cause. In some cases, you may may want to create a new hashtag, and in other cases, it makes more sense to piggyback on an existing hashtag. Tools like HashtagifyMe can be very helpful for helping you to identify the best hashtag for your campaign. Nonprofits who may have multi-faceted missions or causes will likely want to create a range of different hashtags, ideally all collected to different collections of stories and media. Doing so allows you to extend your organization’s reach across multiple online conversations and potentially reach more new supporters. Nonprofits create digital stories because they want these stories to build community and spur action. The smart use of hashtags is one of the most promising tactics for doing so.